This is a favorite for everyone, kids and grownups alike. Though it’s green in color, I promise you won’t “taste” the green, just the sweetness of the mixed ingredients. It’s a great way to introduce kids (or reluctant spouses, or yourself) to the world of green smoothies – especially those who usually say no way to green! Add fruit to food processor and blend coarsely. Blend to the consistency of your liking, adding water if necessary. You may add ice if you like, though if you use frozen fruit you probably will not need to. For smoothie first-timers, if this drink's not sweet enough for you (though I think it will be, even if you tend to have a sweet tooth) you can add either more mango or banana. Finish blending and enjoy! This drink's green color truly proves how potent the chlorophyll in the spinach is (along with its many health benefits). 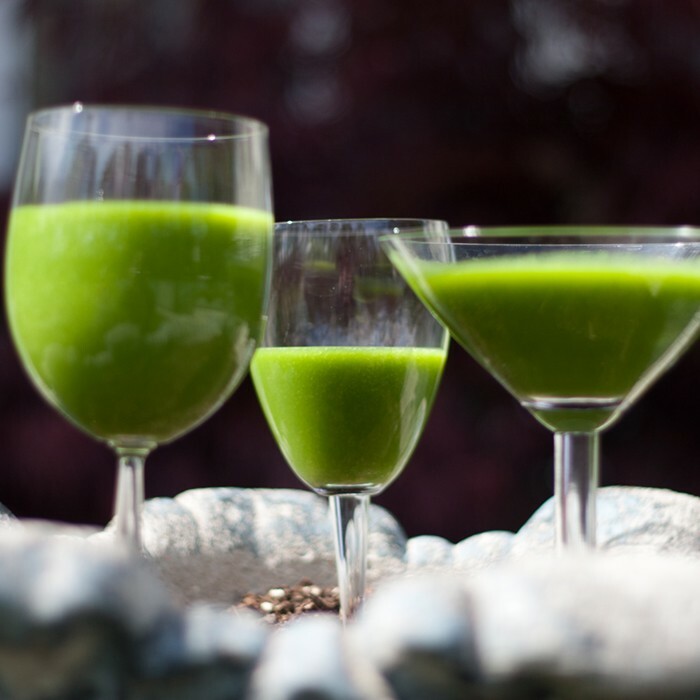 The goal, once you realize you CAN a drink green smoothie, is to start to change the portions - moving up to 2 parts green per 2 parts fruit - the more green, the better. Smoothies are an amazingly easy way to get all the servings of fruits and vegetables you need daily. Trust me on this one - I've had 5-year-old guests come back for seconds!